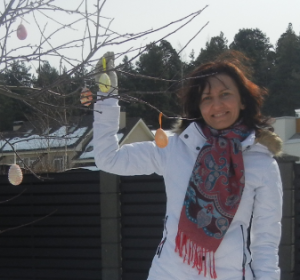 (29.03) No.284.1 – János Mikitovics – An improved version of No.284 is published on the same page! (25.03) No.287 – Emmanuel Manolas – Long white K-series combined with surprising R-promotion! (21.03) No.285, 286 – Gani Ganapathi – Two problems with Equihoppers: h#3 with Chameleon promotions and hs#2,5 demonstrating Anti-Circe! (18.03) No.284 – János Mikitovics – One more Happy birthday problem dedicated to Seetharaman Kalyan! (18.03) No.283 – Vlaicu Crișan – A surprising demonstration of Superguards condition dedicated to its inventor! Happy birthday to Seetharaman Kalyan! (17.03) No.282 – Paul Rãican – Interesting example of the rarely used fairy condition Cage Circe! (12.03) No.281 – Anatoly Skripnik with the second duplex on Julia’sFairies! Warm welcome to Anatoly! 68 – hs#2,5; Nightrider; composed in November-2012, published in VARIANTIM – 2012, No.58. (08.03) No.279, 280 – Two very good Take&Make problems by Pierre Tritten! (05.03) No.277, 278 by Chris Feather – A very exotic combination of fairy conditions Anti-Kings+Anti-Circe! Enjoy the problems and author’s explanations! (04.03) No.276 by János Mikitovics – One more Happy Birthday-problem! See surprising finals with Chameleon-promotions! 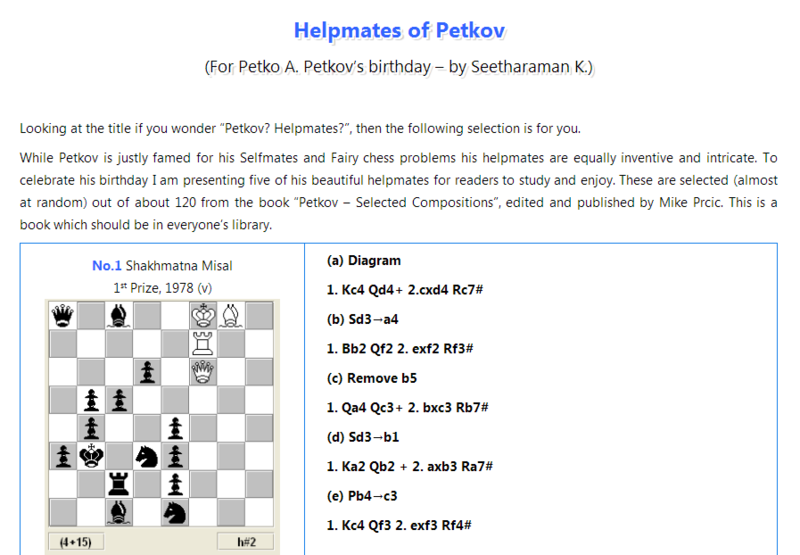 (04.03) I have a pleasure to present you a Happy Birthday article by Seetharaman K. dedicated to Petko A. Petkov! (03.03) No.274, 275 by Valerio Agostini. No.274 – A nice Bristol realized with Nightriders; No.275 – A very good activity of Andernach Grasshopper!